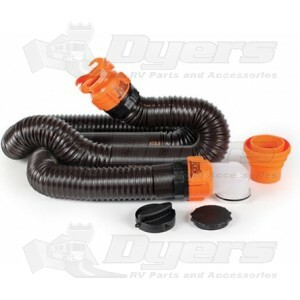 Features a 15' RhinoFLEX sewer hose with pre-attached fittings for greater convenience. We started with a 15' RhinoFLEX sewer hose, and pre-attached specially engineered fittings to make it even more convenient for you. At the RV end of the hose, there is a super-tough bayonet fitting with 4 prongs for a more secure fit. At the dump-station end, we’ve added an easily detachable 4-in-1 adapter for fitting to 3" slip or 3", 3-1/2" and 4" threaded pipe. It’s a ready-to-use kit made with the toughest hose you can buy. With new pre-attached swivel fittings featuring a reusable locking ring so that fittings can be moved to a new RhinoFLEX hose. Bayonet cap and elbow cap also included. The removable 4-in-1 adapter allows you to store in 4” square bumpers. Bayonet cap and elbow cap. I had it set up at property for normal use. It was exposed to sun for 2 to 3 months but not extreme weather. Un hooked and placed in bag to transport to vacation spot. once i hooked it up again and emptied tank leaks showed up everywhere in the joints. plastic seperated between the wires. The new hose I ordered seems to be fine quality. Currently I am struggling to fit in my bumper storage, but have a small amount of damage, that once I have corrected I think it will fit. Will be dissappointed if I can't fit, as I will replace with somthing that does. I'm certain it will work fine. I am really happy with the rhinoflex sewer Kit. It made hook up much easier. The only issue is storing it, as it does not fit inside the rear bumper. one of the best sewer connection kit. comes with end caps and is very solid!